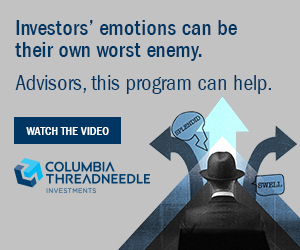 Market volatility can lead to productive conversations with clients about long-term strategy. CL: ...and be pretty bummed out at where the returns were, It was one of those shorter episodes in which diversification didn't work, But having a longer term perspective, I think, is really critical, now more so than ever, and not just to let 2018 shake you, where you say, "I'm never going to invest money again." SS: So it's actually offered an opportunity for us to have some really engaging conversations with our client, albeit somewhat difficult initially. But by the end of most of those conversations, I think we're on the same page to say, "Great, I understand what we're doing, I understand why we're doing it, I understand that these types of thing can occur, but that that doesn't mean I'm not going to be able to reach my goals." CL: I think this is a great time to have those conversations about the overall strategy, and to help talk about the market environment, and talk about the strategy and the long-term prospects for their investment strategy. You want to tell someone to stay invested, but yet cash at 2 and a quarter percent looks reasonably attractive, and it’s tracking at or slightly above inflation? SS: So I think one of the things that we're challenged with is saying, why don't I just go back to, you know, kind of what my parents and my grandparents did? Invest in U.S. companies that I can understand, and in cash, because we are finally reaching -- now, you and I both know that, historically a, you know, 2.5% cash rate is, it's not that great. SS: But I think compared to where we've been, it does seem like a meaningful option. I think that our clients, because it's paid essentially nothing since the financial crisis, they see us going to cash as not an investment decision. That's an absence of a decision. So one of the things that we're having to pivot and talk to our clients about is that, if we do try to put a position in cash, that's something that we feel is available for investment at a better time. But you are returning, and it is actually an explicit investment decision to do that. CL: Yes. I absolutely agree with that, and I think to string it together: you want to stay invested, but staying diversified, I think, is really important, even though diversification hasn't paid off. I think it will pay off over a long period of time, and very recently we've seen some benefits of diversification, where stocks and bonds haven't just moved together. For me, I keep falling back on the best advice anyone ever gave me, which is to stay invested. The views expressed are as of January 2019, may change as market or other conditions change and may differ from views expressed by other Columbia Management Investment Advisers, LLC (CMIA) associates or affiliates. Actual investments or investment decisions made by CMIA and its affiliates, whether for its own account or on behalf of clients, may not necessarily reflect the views expressed. This information is not intended to provide investment advice and does not take into consideration individual investor circumstances. Investment decisions should always be made based on an investor's specific financial needs, objectives, goals, time horizon and risk tolerance. Asset classes described may not be suitable for all investors. Past performance does not guarantee future results, and no forecast should be considered a guarantee either. Since economic and market conditions change frequently, there can be no assurance that the trends described here will continue or that any forecasts are accurate. Columbia Management Investment Advisers is not affiliated with Boston Private Wealth LLC and has no responsibility for its operations or services.